SAN FRANCISCO (MarketWatch) — Activision Blizzard Inc. posted a strong rise in first-quarter earnings on Wednesday afternoon, beating Wall Street’s estimates thanks to a robust debut of its “Starcraft II: Heart of the Swarm” PC game. A lot more at link, including sales figures. 1.1 million day one. Everything is mentioned, even future expos for WoW... How come isn't LotV mentioned? 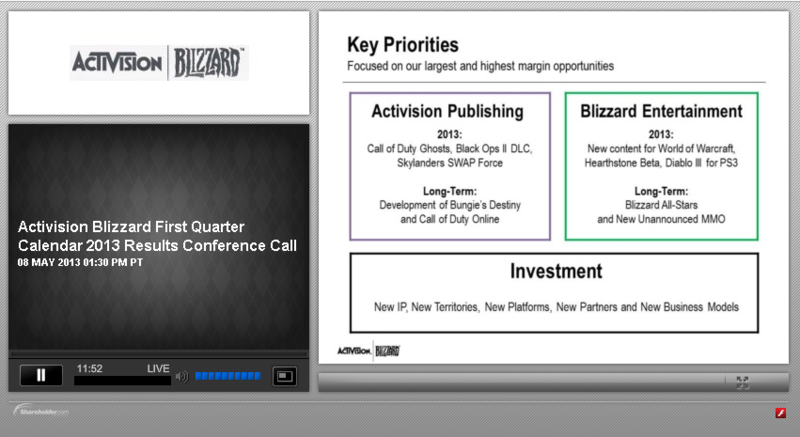 Lol love how LOTV isn't even on "long-term" for blizzard division. Interesting but yet more from genericom inc. That is purely investor focused noise. They'll probably announce it at Blizzcon 2014 (for release in late 2015 or early 2016), I don't see why they would rush an announcement this year. WOW lost another 1.3 million subs and is down to *only* 8 million now. HotS just came out. Why are people worried about LotV? Yeah if anything, the success of HotS will ensure that LotV will come out in ~3 years. Probably less. Because people are afraid that it will get cut and never comes. At the start of SC2 it was planned to release hots 6-9 month after Wol. And now its not even in the long term plans. I think Titan will just WoW 2. Yea they are saying its a new universe and stuff but no company with a brain wouldn´t make a sequel of such an insane successful product. I'm pretty sure they made more off of a month of WoW than they did from all of sc2 and hots. What is it, 30 million users at $15 per person? Hence, the reason why the game lacks attention a lot of the time. They'd have to make day1 sales every 3 days to compete. So, basically SC2 is a side project. Consider yourselves informed. MMOs work differently, sequels usually fail and everyone has had enough from tabbing. And one of the most important things is the battle system. But I doubt they will try to define the MMO genre completely new. So it will be based of WoW like every other mmo.